It is not uncommon for IVF patients to have an unsuccessful cycle, sometimes even several, before they finally get pregnant. It is certainly disappointing to have a failed IVF cycle. However, there are some options and tests available that may improve your chances of having a successful IVF. To name a few…. Comprehensive Chromosome Screening, DNA fragmentation for males, chromosome testing for males, immune testing for female patients. Although fertility doctors and scientists made a big leap in understanding the reproductive health, IVF process remains intricately complex. If your first IVF cycle wasn’t successful, we want you to know that you are not the only one. 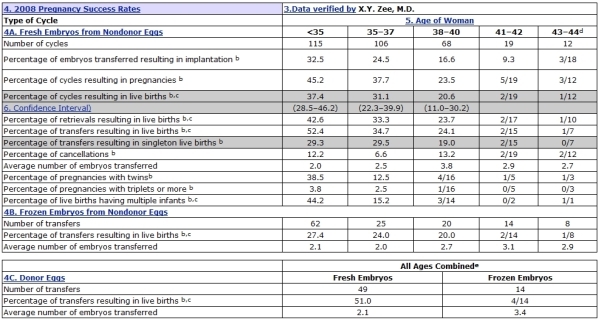 We wanted to share some statistics pertaining to success rates in IVF. CDC’s website is a great source of statistics about IVF treatments in the U.S., if you need additional details. Before we go any further, we would like to mention that MedVacation’s IVF clinics had several 56 year old patients whose IVF treatments were successful. We recently saw an article that talked about a 66 year old Ukrainian woman giving birth to a healthy baby boy. We are certainly not advocating child bearing at 66. Neverthless, you probably still have a few more years to try IVF a few more times. First of all, the biggest factor in IVF treatments is the age of the female patient. Typically, once the woman turns 40-41, many doctors will recommend she uses an egg donor. There are three tests, ovarian reserve tests, that fertility doctors can perform to determine one’s ovarian reserve and the need for egg donor. Misconceptions about the causes of infertility are still quite common in our society. Often people automatically assume that the woman is the cause of infertility. Approximately one third of all infertility cases can be attributed to the male factor. If your first IVF was unsuccessful, we would recommend that your IVF doctor do a few tests on your husband as well, if the they have not done so already. Your IVF doctor should order Chromosome Testing for your spouse. In addition, they should also do DNA fragmentation test on his sperm. There is another great IVF test that has recently became available to hopeful parents. It is called Comprehensive Chromosome Screening or CCS. This ground-breaking IVF technique is utmost accurate method for the analysis of all 24 types of chromosome. More and more, IVF specialists recommend this type of screening for patients who have had multiple failed IVF cycles or numerous miscarriages. We recommend you and your current IVF doctors look into this type of testing.